With up to 94 inputs and outputs, is this the best connected interface on the planet? Multiple analogue and digital sources in one incredibly flexible, high-quality device. Complex for the non-professional user. You might find yourself paying for connectivity you just don’t need. Over the past 20 years RME has consistently produced equipment that has won the respect of audio professionals in music, broadcast and film with its innovative designs, excellent value for money and incredible reliability. The UFX+ is the latest in a long line of products which incorporate a high level of connectivity both in the analogue and digital worlds and will seamlessly provide enormous flexibility when recording across multiple formats. Starting with the basics, the UFX+ will connect to a computer either via Thunderbolt, USB 3.0 or USB 2.0. It can run up to 94 simultaneous inputs and outputs (at sample rates of 44.1kHz and 48kHz) and with the software utility called TotalMix FX+ can record, route and sub mix all of them while providing multiple low latency monitor mixes. The layout of connections and controls is well thought out. On the front panel you have four Mic/ Instrument Combi XLR/jacks followed by two 1⁄4” TRS sockets for headphones. To the right of those are the first of a pair of MIDI in/out sockets and a USB socket labeled Memory (which we will explain later) and then a large rotary encoder which has multiple functions, four small buttons for different display functions and lastly two smaller rotaries for the headphone outputs. To the rear there are eight TRS line inputs and six TRS line outs with outputs 1 and 2 on XLRs (so connecting your monitors is simpler). You then get an AES In/Out on XLRs, both co-axial and optical MADI connections, two ADAT light pipe ins and outs, USB, Thunderbolt and remote USB sockets, the other MIDI ins and outs and the IEC power socket. It’s a lot of connections but somehow RME has managed to make sense of them all. We tested connecting everything and while it gets pretty busy it is still possible to access every connector without too much effort. The things you need most are sensibly on the front panel. So having got your head around all the connection possibilities, where do you go from here? Firstly let’s deal with compatibility and channel counts. If you are using USB 3.0 or Thunderbolt you have ostensibly the same possibilities as there is enough bandwidth to deal with 94 channels of record and playback at sample rates of 48k and 44.1k. When you go to 96kHz sample rate, channel counts halve, so you would go from 16 channels of ADAT to eight and 64 channels of MADI to 32, and at 192kHz they halve again. This means total compatibility with any digital protocol in the formats provided. While sample rate affects the number of channels available in the digital connections, the analogue inputs and outputs are not affected - so their channel counts remain constant. So as you can see, the UFX+ allows you massive exibility in recording and monitoring multiple digital and analogue sources, all within one single U box. If you only have USB 2.0 available you have to forgo the MADI connection for direct recording but you can still pick up signal from it within the internal mixer and route it around via the TotalMix utility. RME has supplied TotalMix FX+, the mix Utility, with all of its interfaces for many years now and as it is a scaleable system it is fundamentally the same whether you use it with their simplest interface or the flagship UFX+. You can run the UFX+ without it, accessing everything directly from your DAW software but if you want low latency monitoring and the ability to build multiple monitor balances outside of your DAW it is excellent and more than up to the task. This most recent version has reverb, EQ and dynamics processing and with the UFX+ an incredible 4096 channels. If that sounds a bit scary, well, at first glance it is; it’s certainly a mixer you will have to learn. It is possible to set up a separate mix for every pair of outputs but in practice you may just want to use the two dedicated headphone outputs on the front of the unit plus balance in inputs to your main monitoring. The UFX+ can also function as a standalone recorder making it an even more flexible unit, and can record a staggering 72 channels of audio onto a suitable memory stick. This is a particularly useful feature if you want to record, say, a live set from a front of house desk equipped with MADI. Using the Record View option in TotalMix you can assign channels to either record or play back (so you can do virtual sound checks too) and once set up, record and playback functions can be accessed from the front panel. 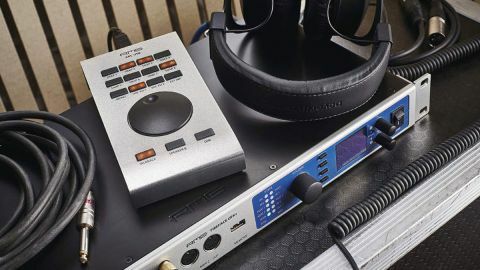 It removes the need to take extra computers along to shows and can even be used as a simple way of recording rehearsals or jam sessions using the mic and line inputs. To simplify operations even further you can buy the ARC USB, a very useful small footprint controller for TotalMix which has dedicated buttons for Monitor levels and speaker switching, headphone levels, talkback and dim. There are also eight buttons which you can assign to different functions, letting you build a personalised controller to suit your work flow. It’s a solid, well-built little unit and is a very worthwhile addition to any RME-based studio setup as it’s backwards compatible with all interfaces using TotalMix. On the digital side, RME has always been right at the top of the tree. Its reliability is legendary, something we can attest to personally as we own one of its other MADI systems and a RayDAT system. On the analogue side it is up there too. The Mic and Line Amps and DI inputs sound excellent, crisp and clean with great depth of field and clarity. That said the UFX+ is dear so be sure you require this level of functionality before purchasing it, but if it fits your requirements you won’t be disappointed. It really is quite an amazing bit of kit.